The bottles in question with Herbal Essences' demeaning "jokes". Each bottle contains an “Herbalhead” joke question that can be matched with the answer on the conditioner bottle. All good and well: who wouldn’t like more entertainment in the shower? So I read my bottle, which asked me what gem could improve your love life. Curious, I picked up the similarly orange conditioner bottle to discover the matching answer: Diamonds. Uh… Wait… what?? Are my shampoo and conditioner actually suggesting that most women would prostitute themselves for diamonds? That men just need to buy an expensive gem for a women to get laid? 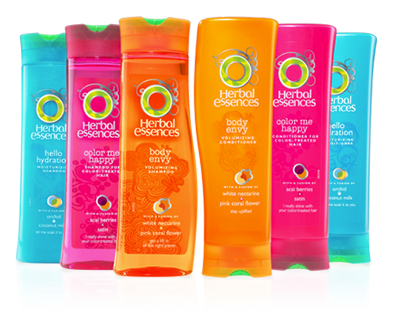 Wow, Herbal Essences, just… wow. How could anyone at a major corporation, that presumably puts extensive thought into designing and marketing their product, possibly think that such demeaning and juvenile jokes are acceptable and even ‘funny’? In this day and age? Absolutely shocking. You better hope that only kids bother to read them. And I’m not even going to start on the nudists-volleyball joke that suggests that all nudist are oversexed perverts. I’m simply done with Herbal Essences. Oh and a piece of advice to Herbal essences: Fire your incompetent designer before more women notice the back of your shampoo bottles.